That is an amazing pic, Janey, you have a garden to be proud of. Lovely and a bargain ! Gorgeous Janey...a great Wilco bargain..well found ! Titter...ooh and I thought I was getting a compliment!! Lol Restrictive growth Flori....yep that's always been my problem, no wonder I had so much fun with your home for the bewildered blog....Lol!! You are our very own blushing rose, Janey, just watch out for the aphids! LOL! I just couldn't picture you rambling all over a wall, let alone being pinned to one, you much too ladylike!!! Tee hee hee! LOL Janey, a nice quiet darkend room for you then my friend...... Tee hee hee! That is a lovely picture Jane. Wow Janey, it looks great, as does your house. Ha ha.....we seem to have a thing about being doped up Flori!! I bet you get tired San on your feet all day......still weekend is here girlies...anything exciting planned? We have open gardens in the next village on Sunday...was hoping Ian would be coming too....but of course it is the world cup final! no chance..Lol! 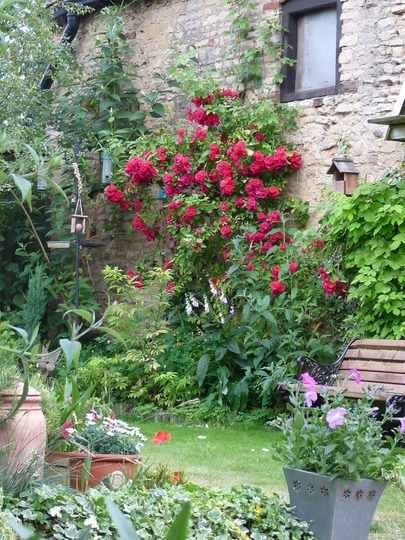 Its a very nice barn wall to have in your garden Janey, the rose obviously loves it. Much nicer than having a fence Janey. I like privacy too Janey. It looks gorgeous. Great photo (and rose, of course!) won't you send it in and share it with my readers? Go to http://www.allaboutrosegardening.com/Favorite-Rose.html and send in this picture, and tell why it's your favorite rose. People Love to see pictures of lovely roses like this. The wall makes it stand out, and look enchanting almost! What a relaxing, peaceful looking spot. Did you get to take advantage of that bench ? Found it.......I had commented before, it does look like ours, so fingers crossed it is. Hi Wells, climbers and ramblers are what I have I'm afraid. In my small garden I have 9...... Even I couldn't believe there were so many...lol! On the shrub Rose scale, we have David Austin roses here in the UK.....he has a fantastic selection of beauties...if you have a look on line at them, you're bound to be amazed....:0)). See who else is growing Rosa filipes (Rambler rose).